This Choice royal blue full length bib apron with pockets is a stylish alternative to plain bib aprons. With a curved silhouette and strong, low ties secured to a narrow bib, it will look great on your baristas, bartenders, or bakers. This apron offers a sleek, clean look as it is made of heavyweight deluxe poly / cotton blend. 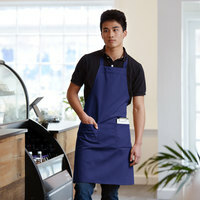 This royal blue apron provides a durable, full coverage solution to protect your and your staff's clothing. The aprons were the appropriate the length for the average sized person. The color is bright and hasn't faded yet. The only thing that can make it better would be to extend the string to get a chance to have tighter knots and a more secure apron. Overall this is a good apron to purchase. The price and the material I like a lot. Ideal for both men and women. It has pockets which help carry things like your phone. These aprons are great for a wide variety of body shapes of the students taking our classes. We did however make the mistake of using the aprons before we washed them, which left some dye on our clothes. Perfect choice for our back of the house staff. Keeps them clean and they look neat when they walk around. This makes it easier for guests to know who works for us. Fantastic product at a wonderful price! Colors did not fade when washed. My Staff loved the bright blue that matched Our school colors! Buying again! Love the blue style, they match our uniforms really well. Great material and made to last I recommend this to any type of business/ restaurant. Nice quality aprons. We launder them ourselves and we have found that they hold up really well. Three front pockets for holding whatever is needed! I love these aprons, the material is very strong and durable. My employees do not mind wearing these stylish aprons and I love the vibrant color. Wonderful product it is! With the great price, beautiful color, nice fit and easy care, I will definitely buy more. I am so glad this website offers so many color option. This is a really nice great fitting following babe eight for the pockets in the front are very helpful their bag and they hold lots of stuff like pens pads straws etc. Thank you for the great aprons,great strong material and good price, this is my favorite color to, I ordered different colors but blue is the best. Perfect for our Staff. Nice quality, and we would buy again! Recommend to anyone that is looking for a good quality product for their kitchen. Excellent price for a durable apron that's stood up to numerous washings and comes out looking great. The longer length is great for taller people (my husband is 6'4" and they fit him well). Pockets are great for small items like recipe cards and instant-read thermometers. Seems to be of good quality so far. They will work great for my fish cleaning busines, plus the color matches my building perfectly. I will definitely be ordering more. Bright blue color brings life to the back or front of the house area. Color is true to the picture and the material is strong. I absolutely love this product! This choice royal blue full length bib apron with pockets is great for our restaurant cooks and preppers. The apron covers entire front body! We bought these aprons for our annual Greek Fest. They wash well and add a level of professionalism to our volunteer kitchen. The color is beautiful!! We love that CHOICE aprons are good quality fabric that comes in many colors and sizes. They are easy to slip on / off and wash when needed. If I could rate them lower I would. Pocket stitching came apart immediately. Happened to all 6 that we ordered. Will never order these again! Thank you for the review, Timothy! We're sorry these had faulty pocket stitching. A Customer Solutions Representative will contact you about this promptly. Must be honest here, this apron is small and not very heavy duty as I was hoping, our aprons get lots of use and I was hoping to replace some worn out one. Thank you for the review! We're sorry you were not pleased with the aprons. We suggest trying these Chef Revival 601NP-RB Customizable Royal Blue Bib Aprons instead! I use these when preparing and serving food for/in my food trailer. good product. .Excellent price. Helps keep clothing clean and dry. Keeps me more presentable. I love the color and material of it because it will last longer.it's long just like I like it so nothing want get on my clothes. Very good quality aprons for an affordable price. I purchase it for my restaurant .The deep pockets are very convenient to hold tape and a marker. Washes easily and looks nice. We use these aprons nightly. The only problem with the aprons is that after a few times being washed they are fading. Overall these aprons are bring a different appeal for our workers. Instead of using these for the front of house at my restaurant, we use these for the back of house kitchen staff. It provides extra protection. Love this apron. I'm 6'4" and it's plenty long (but not overly so) and I really like that the strings are long enough to reach around and tie in the front. Great pockets and the material feels durable. This blue full length bib apron helps keep clothes clean, and it cleans up well. The blue is bright, and keeps color nicely after washing. These are pretty blue aprons, but they bleed a lot in the wash and the ties tend to come off and need constant reattachment. Would rather spend more on a better apron. We have been purchasing these aprons for years now they are light in weight very durable and the cooks like them great value lots of bright colors to choose from! you can't beat the price and quality, I am about 5ft tall and still works great for me. I have washed it several times now and it held its blue color. A very bright blue, and holds true to its color and washes well. Some products like chocolate for instance, shows on this color but in all, not a terrible choice for a restaurant. When I ordered these aprons I really thought because they were so inexpensive they\'d be just cheap nothings we could throw away when we could afford better ones, well, their NOT CHEAP THROW AWAYS ! their exactly what we needed. I\'ll be ordering more as we need them! Thanks Webstaurant !!! I'd been looking for a new full-length apron and was happy to find this one. It's not bulky like some aprons, which I don't like, yet it still gives good coverage. I also liked the fact that it came in multiple colors. overall this is a very good product. looks great on the staff, cleans very well. pockets are placed just right. the only thing is that they are a bit heavy for an apron.